These are holy days, sacred days. And not just because it’s Easter. I am at my Mom’s, sitting with her. And while her decline has been consistently slow, the changes this week are significant. My youngest sister, Rachel, her husband Eric, and their little Emma, moved into the basement. So we could have full-time hep for my Dad. My entire family will be forever grateful to them for doing this. Rachel has been amazing, so selfless and strong in this caregiving role. This is Emma, making my Mom smile. It is impossible to move Mom without two, even three of us, helping now. She cannot support her weight or balance herself, even sitting. She has not answered any of my questions today, and her eyes have dimmed. She knows I’m here, but it’s hard for her to raise her head. She is sleeping almost the entire day, eating less, and the steroid is becoming ineffective. I can tell things are shifting. As I put up Easter decorations though, I am happy. Happy that I know the Easter truths. Know them in my marrow. Christ is our answer for peace. The Easter truths teach us this, and they are everything to me. I am counting on His promises. Promises of resurrection, renewal, of grace through every difficulty, and reunions beyond now. Sweet Amy, who lives a few streets over, brought me this darling garland today. She has a popular Etsy shop called The Bees Knees where she sells felt ball garlands, felt banners, canvas pennants, and other cute decor for special occasions. Take a look! Or find her on instagram @thebeeskneesshoppe. Thank you for this gift of home-made love, Amy. Yesterday we cut peach boughs and Eliza decorated our Easter Tree.We didn’t do it on Palm Sunday because we had a surprise snow the evening before. Heavy and wet. Bowing tree limbs to the ground. Ours bent so far it snapped – severed one third of our black cherry. We found it like this Sunday morning. Sad to lose part of our tree! But grateful it didn’t hit one of our cars. Doug sawed it up and within a day most the snow was melted. Palm Sunday – Make Easter Tree. Read about Triumphal Entry. 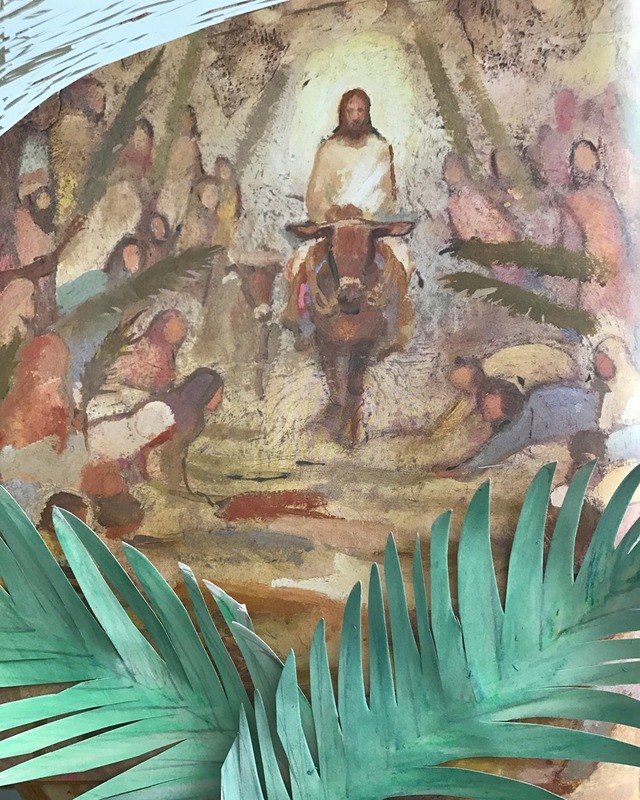 Watch video of Triumphal Entry (link to all videos below). Monday – Read about Jesus’ second cleansing of temple. Watch video of Jesus cleansing the temple. Tuesday – Attend temple or walk around grounds. Read some of Jesus’ teachings during the last week and watch videos (The Greatest Commandment, The Widow’s Mite, Ten Virgins, Parable of Talents,Ye Have Done it Unto Me). Silent Wednesday – Easter Walk. Read about Jesus raising Lazarus. Watch video. Holy Thursday – Passover/Seder Meal. Read about Last Supper and Gethsemane. Watch videos. Good Friday – Make Hot Cross Buns. Read about Crucifixion. Watch videos. Saturday – Easter Lanterns. Read about Jesus’ burial and preparation. Talk about this day of waiting and anticipation. Watch video. Easter Sunday – Church, Easter baskets, family dinner. Read about resurrection. Watch videos. After doing my Mom’s nails and feeding her some soup, my Dad and I decided to take her outside. It’s been weeks since she has been out of doors. But we put on her jacket, hoisted her into the wheelchair, and pushed her outside. I wanted her to see the tulips and daffodils Dad planted for her in the fall. Daffodils are one of her favorite flowers. Because it is the first flower of Spring. A symbol hope. So down the hill we went to the western end of the yard to show her the new flower garden. Won’t it be gorgeous when all those bulbs spread and grow in colored bunches? My cute parents. It was such an effort to get my Mom to hold her head up, but bless her heart, look at her trying to smile. Then we walked her up the hill to see the crabapple bedecked in blossoms. Isn’t it glorious? My Dad pointed out everything in bloom. He’s been working so hard to keep her gardens going. I picked a hyacinth for her and we swooned over the scent. Then I picked this orange tulip for her, and we made our way inside. I spoke with the kids tonight about the changes in their Grandma and how things will be different the next time they come with me. How she will be in a hospital bed instead of on the couch, so she can sleep in the main family room. How… we have to start tapering her off the steroid… and letting her go. There were tears and questions and hugs. But every conversation led us back to Jesus. How His gifts make everything right. Enjoy your Easter week. May you gather light and love. And may you share it with others. There is so much angst in this difficult world, so much rending and aching of the heart. No doubt you have your own hidden sorrows or worries that are bending you low – maybe to the point of breaking. Hang on. There is One who knows precisely what you need. He is waiting for you, and for me. And He offers us peace. Blessed holy days, my friends. Mother’s Day Giveaway from Barnacle Designs! Thank you for this beautiful and tender update. I am so glad this is spring and the time of celebration of the Savior, his atonement, and the resurrection. This is beautiful. Thank you for this powerful reminder of the Atonement. I hope you have a lovely, blessed Easter. "for if they never should never have bitter they could not know the sweet—." i love you. You are in my thoughts and prayers, Cath, at this tender time. As always, thank you for your exquisite expressions of faith.